The first installment of the fall IE Decisions Systems Engineering Seminar series, presented by the SCIDSE, is coming up! Learn about new capabilities of 3D-printing technologies and how it’s being used to replicate natural biological materials with synthetic materials. Nature is the most efficient and effective designer. Multiscale architectures molded and refined by nature are common characteristics of living organisms. Science has always been interested in creating nature-inspired multiscale and multifunctional materials. However, it has proven extremely difficult to replicate these natural biological materials in synthetic materials, partially because the intricate structures need to be developed over many length scales. Additive manufacturing, or 3D printing, has the potential to address this challenge and the capability to fabricate from a digital model in a layer-by-layer fashion. 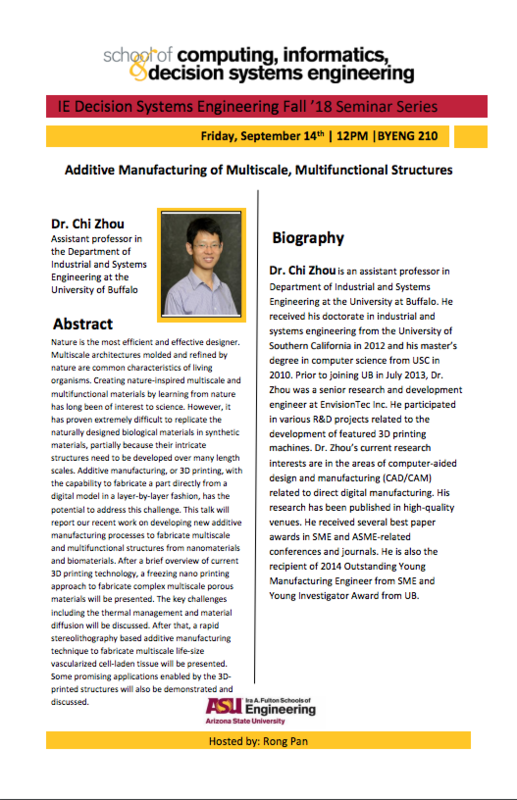 This talk reports Zhou’s recent work on developing new additive manufacturing processes to fabricate multiscale and multifunctional structures from nanomaterials and biomaterials. Learn about current 3D printing technology, key challenges and new developments: a freezing nano-printing approach to fabricate complex multiscale porous materials, and rapid stereolithography to fabricate multiscale life-size vascularized cell-laden tissue. 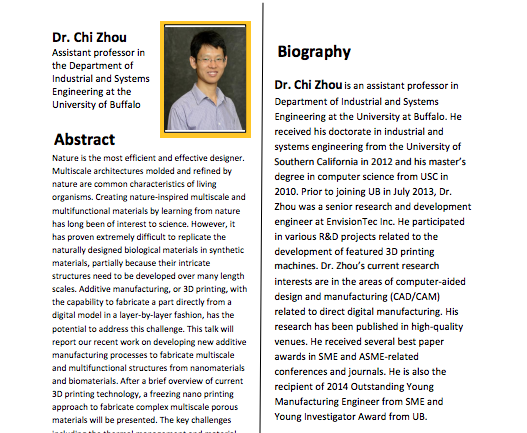 Chi Zhou joined the University of Buffalo as an assistant professor in Department of Industrial and Systems Engineering in July 2013. Zhou was a senior research and development engineer at EnvisionTec Inc. He participated in various R&D projects related to the development of 3D printing machines. Zhou’s current research interests are in the areas of computer-aided design and manufacturing (CAD/CAM) related to direct digital manufacturing. He received several best paper awards in SME and ASME-related conferences and journals. He is also the recipient of the 2014 Outstanding Young Manufacturing Engineer from SME and Young Investigator Award from UB.